Still to this day many Hindus believe that the mythological demons Rahu and Ketu cause solar eclipses? In Hindu mythology there is a wonderful story that describes how the gods and the demons once formed an alliance to produce a nectar that could give them immortality. This is the story of the churning of the milk-ocean and the descent of Lord Visnu as the Kurma avatara, the divine tortoise. When the nectar that was churned from this ocean was being served to the gods, a demon, disguised as a god, sat between the Sun and the Moon in an attempt to procure the nectar. When he was detected by the Sun and the Moon, Lord Visnu immediately severed his head from his body. Unfortunately, it was not fast enough, for the demon had already tasted a small quantity of the nectar and had become immortal. Ever since, this demon is said to wreak vengeance on the Sun and Moon whenever they come near. The head of this great demon is known as Rahu and his tail is known as Ketu. In Hindu astrology Rahu and Ketu are known as two invisible planets. They are enemies of the Sun and the Moon, who at certain times of the year (during conjunction or opposition) swallow the Sun or the Moon causing either a solar or a lunar eclipse. In Sanskrit this is known as grahanam or seizing. What perhaps sounds like a childish story is a powerful metaphor for what actually happens when an eclipse takes place. 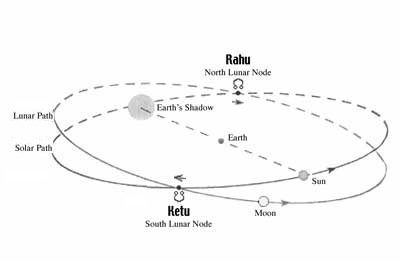 Rahu and Ketu are the astronomical points in the sky respectively called the north and south lunar nodes. To the observer on earth, the paths of the sun and the moon appear to be two great circles projected on the celestial sphere (see the diagram). The sun’s path, the solar ecliptic, makes a complete revolution in one year. At the same time, the moon’s circular path is completed in about one month. Every month the moon will overtake the sun which moves more slowly. This is called new moon or in Sanskrit, amavasya. Usually the moon’s path passes above or below the sun’s path and no eclipse occurs. But, periodically the moon overtakes the sun at the place where their paths intersect. This causes the sun or the moon to be hidden from the earth’s view and is thus called a solar or lunar eclipse. These places of intersection are the north and south lunar nodes, or as they are referred to in Hindu mythology, Rahu and Ketu. Therefore, in the symbolic language of mythology, Rahu and Ketu are said to “swallow up” the Sun and the Moon. The ancient Hindu observers of the sky were aware of the cause of the solar and lunar eclipses and so described the process in the language of metaphor. This entry was posted in Jyotish, Ketu, Moon Nodes. Bookmark the permalink.